FREDDY AND THE MEN FROM MARS. A Freddy adventure that is simply out of this world! With each reissue, this wonderful pig is charming his way into the hearts of more and more readers - adults and children alike. In FREDDY AND THE MEN FROM MARS, the trouble starts when a newspaper reports that six little creatures, believed to be the only martians ever to have visited Earth, have been captured single-handedly by Mr Herbert Garble. This news wouldn't have disturbed Freddy and the other barn animals had not the paper further stated that their friend Mr Boomschmidt had invited Mr G. and his men from Mars to join Boomschmidt's Stupendous and Unexcelled Circus. Freddy, ever ready to maintain his reputation as a detective, immediately suspects a hoax, and quickly sets out to expose it. 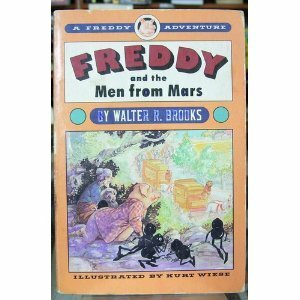 How he manages to do so, with the help of Jinx, the Horrible Ten and several other familiar allies - plus a band of real Martians who turn up just in the nick of time - makes for one of the most hilarious of all the FREDDY tales.